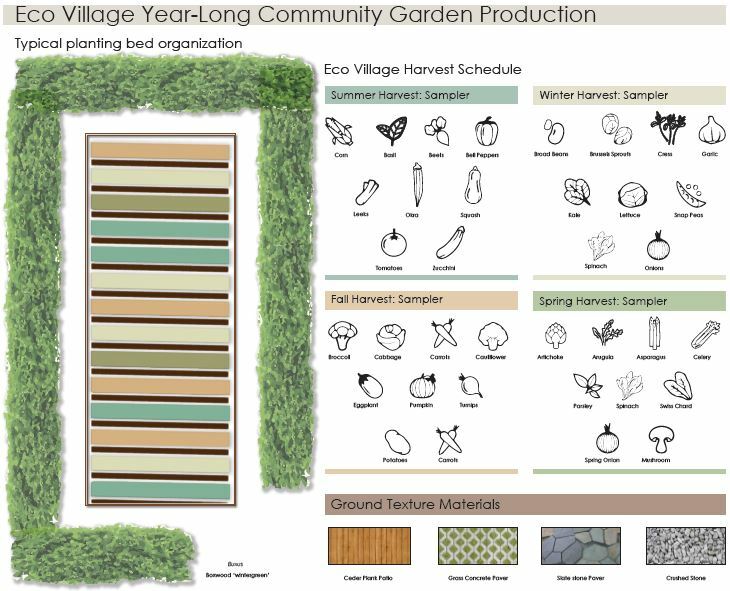 Project Description: The Eco Village is intended to be a community that not only engages but educates. Before the development of the site, it was uninhabited for several years and the site became overgrown, it was with the forward thinking of the designers to decide to use the existing vegetation removed and re-purpose it in the many aspects of the design. It is stated that for every tree that was cut down, 80% of the trunks were reused to build the pavilions and used to construct the raised planting beds. Along with that, the analysis of the soil on the site was of low quality for farming, so additional soil was imported into mounds to elevate the farming vegetation. The design uses a wide variety of planting techniques throughout the site which provides several opportunities to educate the community members. The edging around the gardens in the site are shrubs with the purpose to provide a buffer from the salt in the winters from lowering the pH in the soil. Additionally, the shrubs becomes planting buffers along the roads, house, and plants in order to reduce pollution in site and promoting healthy drainage. In addition to the community and education gardens, there are multiple pollinator gardens, common area for more ways of interacting with the community members. The shade structures provide a connection to the adjacent historically preserved forest. What/Who inspired you to study Landscape Architecture? I joined the ACE Mentor program in my sophomore year of High school. Through the program, I was introduced to landscape architecture. We visited Pennoni and I was profoundly inspired by one of the Landscape architects who talked to my group. . That day , I went home and researched the field of landscape architecture. rom that day on, I knew I wanted to become a landscape architect! My favorite landscape architect is Richard Jones. Recently, I had the honor of meeting Richard Jones at LABASH 2018 at Penn State. He and I share similar values and appreciation of community, craftsmanship and stewardship. I enjoyed learning about his collaboration with Mahan Rykiel Associates and middle school students for the Project Birdland, whose goal is to build birdhouses for endangered and threatened bird species. Along with Richard Jones, Walter Hood, Maya Lin, and Zaha Hadid share similar values that have influenced my outlook on the world of design. My favorite building is the Barnes Foundation in Philadelphia. When it was first announced that a new building was being built on the Benjamin Franklin Parkway and the renderings were published , I was in awe. The Barnes Foundation was the first building that I was able to observe its construction from the ground up. It has clean edges and form, beautiful materials and a great exterior landscape design. t is a beautiful building that adds to Philadelphia’s character, and it holds a special place in my heart. What was your favorite class that you have taken? Last Fall, I took an Ancient to Medieval Art History class which exposed me to anthropology of places and landscapes. I enjoyed the energy portrayed by my professor while describing her adventures visiting historic sites and attempting techniques from many years ago. Describe the most memorable or proudest moment in the studio as a student. My proudest moment occurred when I led a tour of the Stuckeman Family Building. During the tour, I encountered a student from a previous summer camp where I was a camp counselor. He/ She told me that my passion for Landscape Architecture was such an influential factor in her/his college choice that she/he decided to enroll in the Penn State Landscape Architecture program in the coming year. I was proud to see that my words and passion for my major helped a student make the decision to follow in my footsteps. What were your biggest obstacles that you encounter while completing your degree? I found that the biggest obstacle that I have encountered is knowing when my projects are done. As I come to the end of my undergraduate program, I am learning that the feeling of incompleteness is not necessarily negative , but rather an opportunity to build on the project. I believe that my projects are never finished, and I am learning to come to terms that they can only be improved and referenced when working on future projects. Can you describe something/someone who has made a significant positive impact on you as student? Professor Marc Miller has been a mentor for the past couple of years and has made a significantly positive impact on my career as a student. . He provides moral support, encouragement, and has the patience of a saint to answer all of my many questions. At times, he will say nothing and only listen, allowing me to verbalize my ideas and thoughts and, in some cases, saying the exact words I needed to hear. I am grateful to have him as one of my professors and my mentor! What advice would you have for prospective undergraduate student in your field? A degree in Landscape Architecture will offer a variety of experiences. . It is up to one’s attitude to seize and take advantage of the opportunities as they are offered. You never know what you may find or who you may meet. What are your immediate and long-term career goals? I am a senior studying Landscape Architecture at Pennsylvania State University with the intent of focusing my studies on historic preservation, on a national and regional scale. Landscape architecture and Historic Preservation are vastly underrepresented in education and practice. After graduating from PSU, I intend to complete Master studies in n Historic Preservation and Landscape Architecture. Having both degrees will provide the knowledge and skills necessary to advocate for appreciation of (History and Landscape) through design, policy management, restoration and intensive research. With that in mind, I want to take advantage of historical documentation and resources to broaden my knowledge in order to teach. Through h my years of volunteering at PhilaNOMA camps as a Studio Assistant, I have discovered that I enjoy mentoring and educating high school & middle students (about Design & the Built Environment?? ), so I want to become an educator or historian. How has landscape architecture shaped your view of this city and/or your worldview? Since attending college by following my passion of Landscape Architecture, I have found that I have a new-found outlook on the world. I look at physical landscape design as a way to connect people across time and culture. Therefore, I am able to identify (understand?? )cultural landmarks that has shaped the world we live in today, from certain types of vegetation to the placement or lack of buildings. How and When did you get involved with PhilaNOMA & NOMAS chapter? After graduating from high school in 2015, I volunteered with the PhilaNOMA Camp.Sustainability and continue to do so today. When I started at PSU , NOMAS was the first organization that I joined, and I am proud to say that I am the 2018-2019 Penn State NOMAS chapter President. I value connecting with NOMA professionals, other NOMAS chapters and my peers. Being member of NOMA has allowed me to meet professionals from all over the country and understand the values of finding and becoming a role model as a Landscape Architect ., I have built lifelong friendships and would certainly not be where I am today without NOMA.